Events on the Trails of History between now and the end of April can be found in the usual spot. Earth Day was Wednesday, so this post from Linda Bolla at the Erie Maritime Museum is timely. The traveling exhibit "Plastic Waters, from the Great Lakes to the Ocean" will remain on view through May 25 July 6. A series of related programs is planned at the Museum and other sites in Erie. The Erie Maritime Museum's new exhibit, "Plastic Waters, from the Great Lakes to the Ocean," opened April 1st. As we celebrated Earth Day this week, it gave those of us who live on the shores of Lake Erie another opportunity to reflect on both the connectedness of all of the earth's waters, as well as our roles as front line stewards of the Great Lakes, 20% of the world's fresh water. The core exhibit is the result of a partnership between the 5 Gyres Institute, studying the impact of plastic marine debris in our oceans, and the Alliance for the Great Lakes, who have augmented and sponsored this traveling exhibit since September 2014. 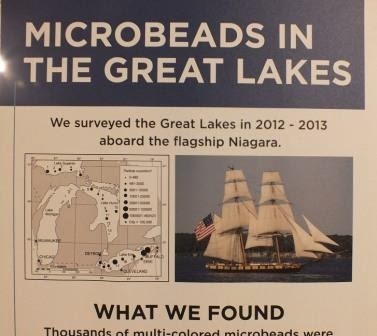 What sets Erie Maritime Museum apart as a host site is the number of local partners who have created complementary displays, and, although totally unplanned, how these local partners echo the themes of the traveling exhibit. 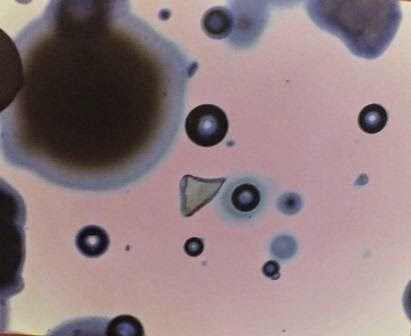 Penn State University Behrend Campus students are currently conducting microplastic studies of Lake Erie waters at the mouth of Four Mile Creek. The students' work will add to our knowledge of this new threat to fresh water. 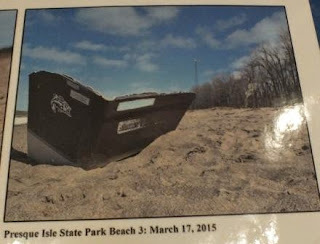 A boat hull found during a Presque Isle beach cleanup in March eerily mirrors the exhibit boat hull pulled from the Pacific Ocean by 5 Gyres after the 2011 Japanese tsunami. 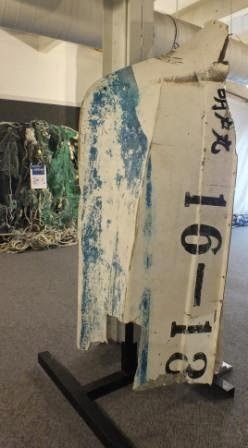 98% of the post tsunami marine debris observed was plastic. 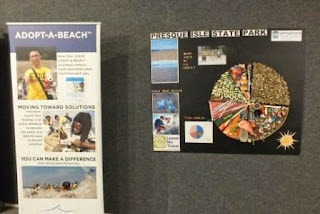 This statistic is reflected in the findings of PA Department of Conservation and Natural Resources (DCNR) at Presque Isle, who developed their own very graphic display for the exhibit from items collected during their annual Adopt-A-Beach programs. Much of the exhibit focuses on single-use (throwaway) plastic that turns up in Lake Erie. PA Sea Grant and International Coastal Cleanup developed educational displays focusing on alternatives to single-use plastics. Even when these plastics are properly discarded in recycling bins, the majority still end up in landfills, due to a lack of capacity in municipal waste recycling programs. 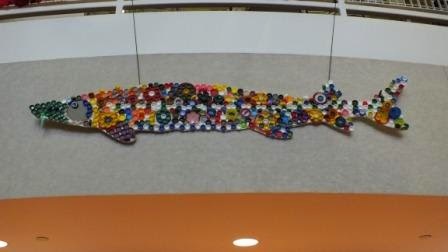 The exhibit also features artwork made by local students using beach clean-up finds and single-use plastics. Accompanying student writings reflect on the need to redesign our throwaway society--profound thoughts for Earth Day, and every day. Belle Valley Elementary School 4th graders studied the endangered Lake Erie sturgeon and made this artistic representation reusing foamcore and plastic bottle tops. Be sure to check out the April program listings for things to do on the PA Trails of History. As National Volunteer Week winds down, we are getting ready for our annual Volunteer of the Year Awards ceremony tomorrow (well, we've been getting ready for a while now, we didn't wait until today--not for all of it anyway). 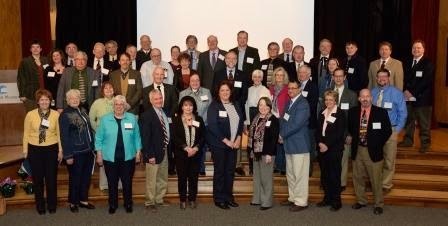 The State Museum of PA will host staff and volunteers from all over the Trails of History as we recognize individuals for specific contributions during 2014. This is one of the high points of our year at the PHMC, a chance to celebrate the work we do together to preserve and present the Commonwealth's heritage. And another chance to say "thank you" to all of our volunteers for more than 112,000 hours of service in Fiscal Year 2013-14. Look for more information in the Trailheads feature in the summer issue of Pennsylvania Heritage Magazine. 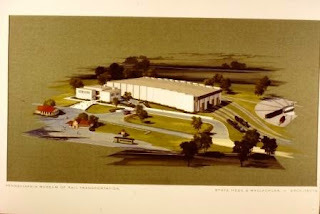 Another cause for celebration this coming week is the 40th birthday of the Railroad Museum of Pennsylvania on Wed., April 22. The original museum building, designed by Stotz, Hess & MacLachlan, was the first in North America designed specifically as a railroad museum. During its lifetime, it has expanded at least twice, and plans for the coming few years include new exhibits and a roundhouse for storage and display of rolling stock. On April 25, the museum will open its 2015 changing exhibit, "Riveted Jacket of Many Colors: A Photo History of GG1 No. 4800," a locomotive also known as "Old Rivets." I usually don't include info in Trailheads that doesn't relate pretty directly to the Trails of History. However, I spent a couple of hours the other night watching this year's entries for "Museum Dance Off 2: Electric Boogaloo," and I just have to share. Organized by an insider-y blog called "When You Work at a Museum," this is the second year of what I think started out as a lark. Last year's Dance Off really created some buzz and so now we have the sequel. Great dancing? Umm, no. Well, mostly no. But it's an international array of staff and volunteers showing off their museums and some dorky enthusiastic dance moves. You don't have to watch them all at once; voting will be in groups for round 1, starting on Monday, April 20. There are some trends - "Uptown Funk" (or parodies of it) and "You Can't Touch This" are popular music choices. And if you've been around since the 80s and 90s, you'll recognize a lot of the dance moves. Anyway, it's really joyful (one from NZ is kind of dark) and a great way to celebrate museums, whether you work in one or just like going to them. You'll find links to all the videos and instructions on voting on the blog. Enjoy! Please be sure to check out the April program listings to see what's happening on the Trails of History. This just in! On Monday, April 6, the PA House of Representatives passed a resolution (introduced by Rep. Kathy Rapp, R-Forest) honoring Col. Edwin Drake on the occasion of his 196th birthday. 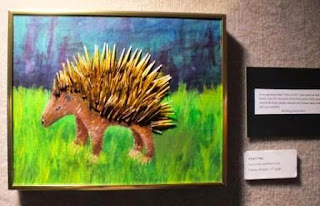 The folks at Drake Well Museum also celebrated the occasion on March 28 with a special program of family activities. Many thanks to all of you who followed along or tweeted with us during #MuseumWeek (March 23-29). Bushy Run Battlefield, Ephrata Cloister, Landis Valley Village & Farm Museum, Pennsbury Manor, Washington Crossing Historic Park, PHMC, and I (plus lots of followers and program partners) spent the week sharing behind-the-scenes photos and much, much more. Sean Adkins, PHMC's information specialist, pulled together a bunch of the tweets on Storify, if you want to see a selection. I'm already looking forward to next year! The Pennsylvania Lumber Museum reopened for the season on April 1 with a shiny new building, and work continues on the installation of the new core exhibit, "Challenges and Choices in Pennsylvania's Forests." The work of many people over a long period of time, this exhibit tells many stories about how people have shaped the forests of this state and about how the forests have shaped the people--from the history of the lumber industry to the birth of conservation and professional forestry, to current best practices and management for sustainable mixed use. The official opening for the exhibit is scheduled for May 15-16. You may have seen or heard that a frozen water main had wreaked havoc at Eckley Miners' Village, causing them to remain closed to the public for about a month (including Charter Day). The pipes have been cleared and the site is back in business. They plan to try to reschedule the March 22 "meet the authors" event, and we'll keep you posted. On May 15, they will dedicate a new state historical marker for the patch town, which celebrated its 160th anniversary last year. It's just barely started to feel like spring, but it's not too early to think about summer camp. Registration is open at a number of Trails of History sites, and at least one week of the Barons and Builders camp at the Railroad Museum of PA is already filled. History camps are on the schedule at Anthracite Heritage Museum, Brandywine Battlefield, Daniel Boone Homestead, Drake Well Museum, Joseph Priestley House, Landis Valley Village & Farm Museum (for grown-ups as well as kids), Pennsbury Manor, Pennsylvania Military Museum, Railroad Museum of PA, Somerset Historical Center, and Washington Crossing Historic Park. 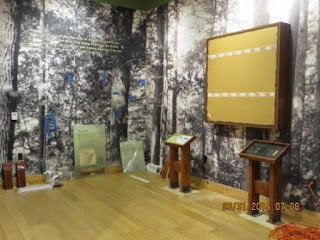 Landis Valley Village & Farm Museum's new changing exhibit has opened. "1865: Lancaster County at the Close of the Civil War" chronicles life in the region in the year the Civil War ended and one of the museum's founders, Henry Landis, was born. 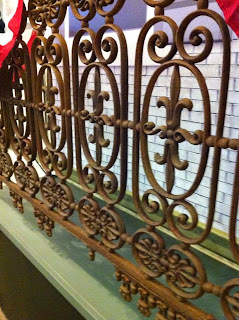 Included in the exhibit is a balustrade from Lancaster's Cadwell House hotel that was touched by James Buchanan, Horace Greeley, Abraham Lincoln, and Teddy Roosevelt; you can touch it too. The exhibit will be on view through December. Spring is finally here and everything is gearing up on the Trails of History. Most sites are closed this Sunday (April 5) for Easter, but the Pennsylvania Military Museum, the Railroad Museum of Pennsylvania, and Washington Crossing Historic Park will be open on their regular Sunday schedules that day. Without further ado, here's the rest of April. April 12: site open—self-guided tours with docents on hand to answer questions. Noon-4 pm. April 19: Weiser Interpretive Program—enjoy an afternoon of living history. Noon-4 pm. April 14: Friends Lecture Series—“The Communities of Cornwall,” with speakers Michael Trump and L. Susan Wentzel. They will focus on Book II in their series of local history profiles, which includes the Cornwall Estate (now part of Cornwall Manor). Lectures are held in Freeman Hall auditorium at Cornwall Manor. 7 pm. April 11: Something More Saturday—Today's focus is Drake Well's Environment; learn about the museum grounds. Included in museum admission; special family rate – up to 2 adults and 3 children for $20. 10 am-3 pm. April 16: Heritage Lecture Series—Jan Woods of Hurry Hill Farm will present a program on maple syrup. Admission: Age 12-64, $5; Age 65+, $4; Friends of Drake Well members, free. Doors open at 6 pm, program starts at 6:30. April 25: Oil Valley Blacksmiths—this organization meets at Drake Well on the last Saturday of every month through October, providing demonstrations for visitors. Included in museum admission. 10 am-2 pm. April 1: Community Days at Ephrata Public Library—Ephrata's popular hands-on educational program goes on the road to the public library. Geared for elementary students and their families. Register through Ephrata Public Library to attend. 4:30-6 pm. April 6: Landscapes at the Historic Ephrata Cloister—bring your own supplies and make art inspired by the historic landscape (a limited amount of art supplies will be available). Open to ages 10-18. Free program; register through Ephrata Public Library. 3:30 pm. April 8: Storytime—Designed for preschoolers and their adults, the program pairs a story with a related craft or activity. Cost is $6 for an adult and accompanying child (age 3-5), $3 for each additional child; FREE with family-level membership in Ephrata Cloister Associates. 10-11 am. April 9: Scherenschnitte Paper Cutting—Ephrata's Student Historians will co-teach this class at the public library for ages 10-12. Space is limited; register through Ephrata Public Library. 4 pm. April 9 and 23: Evening Conversations—April 9 is "Introduction to Genealogy" with Mike Emery; April 23 is "Shoes and Shoemaking" with Marc Benedict. Programs are free (donations welcome). 7-8 pm. April 13: Be an Illustrator—come to the Ephrata Public Library and be inspired by the charcoal drawings of Ephrata Cloister by Roswell Weidner. For ages 8-13. Free; register through Ephrata Public Library. Programs are at 2:30 pm for homeschoolers and 4 pm for public schoolers. These may already be booked by the time you read this. April 18: Making History Workshop—Spinning is this month's activity; learn to use a spinning wheel and a drop spindle. Fee charged. 10 am-noon. April 1: Day Sail Tickets on Sale to Public—4-hour and 5-hour day sails are scheduled starting in May and continuing through the summer (info and registration). April 12: Exhibit Grand Opening and Reception—At 2:30 in Hirt Auditorium, Dr. Sherri Mason will discuss the July 2012 survey of plastics pollution in the Great Lakes that was conducted on-board Niagara. Immediately following the talk, there will be an opening reception for "Plastic Waters." Admission is free and the museum is open noon-5 pm. April 27: Storytime at the Maritime—Kristal Ambrose from the Bahamas Plastic Movement will read Steven Kroll's Stuff! Reduce, Re-use, Recycle and then participants can tour the Plastic Waters exhibit. Program is aimed at children 3-7. Program is free. 10 am. April 8: Lunch and Learn—Colonial Women's Clothing is the topic, with speaker Kimberly Boice, museum educator at Peter Wentz Farmstead. She will discuss the many layers of clothing typical of the 1770s. Participants will have a chance to try on reproduction items. $20 includes the program, continental breakfast, and lunch. Pre-registration is requested; call 215/343-0965. April 19: Site open—Hope Lodge will be open the 3rd Sunday of each month through October. Tours are at 1, 2, and 3 pm. Admission charged. 12:30-4 pm. April 11: Victorian Tea and Tour—get into the Victorian mood by visiting the new exhibit, "1865: Lancaster County at the Close of the Civil War." Attendees will then enjoy a guided walk through the village and a three-course tea at the Landis Valley House Hotel. The day will wrap up in the Firehouse with a talk on Victorian Hair Jewelry presented by Lucy Cadwallader. Reservation deadline was April 1, but call 717/581-0590 to see if space is still available. $32 per person. Starts at 10 am. April 18: Plastic Soda Bottle Butterfly—part of the Museum Store’s “Folk Art and Friendship” series. Cost is $10. Registration is required; call 717/569-9312. 1-3 pm. April 18: Spring Benefit Auction—there’s a silent auction and a live auction (UPDATE: more info here), plus food and beverages for sale, to benefit the museum. Doors open at 4 pm for preview, silent auction, and food sales; live auction starts at 5:30 pm. April 1: Village reopens for the season—the visitor center has been open this winter, but not the village buildings, so it's time for a return visit. Open Tues-Sat, 10 am-5 pm, Wed & Thu until 8 pm; open 2nd Sunday each month, noon-5 pm. April 11-12: Hands-on History Weekend—open 10 am-5 pm on Saturday, noon-5 pm on Sunday. April 12: Living History Theater—The Penn Family will be taking up residence finally, and the servants are preparing for their arrival. Included in regular admission. 1-4 pm. April 19: Open Hearth Cooking—It's "Spring in the 17th-century Kitchen" and the cooks are using fresh greens, eggs, and milk. Included in regular admission. 1-4 pm. April 26: Garden Highlights and Mead Demonstration—"Get Your Buzz On" as the gardeners talk about the importance of bees to the garden and the brewers use honey to make mead. Included in regular admission. 1-4 pm. 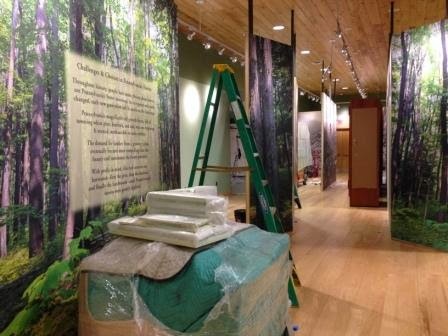 April 1: Site reopens for the season—come see the new visitor center and get a sneak peek at the new exhibit in progress (grand opening in May). Open Wed-Sun, 9 am-5 pm. 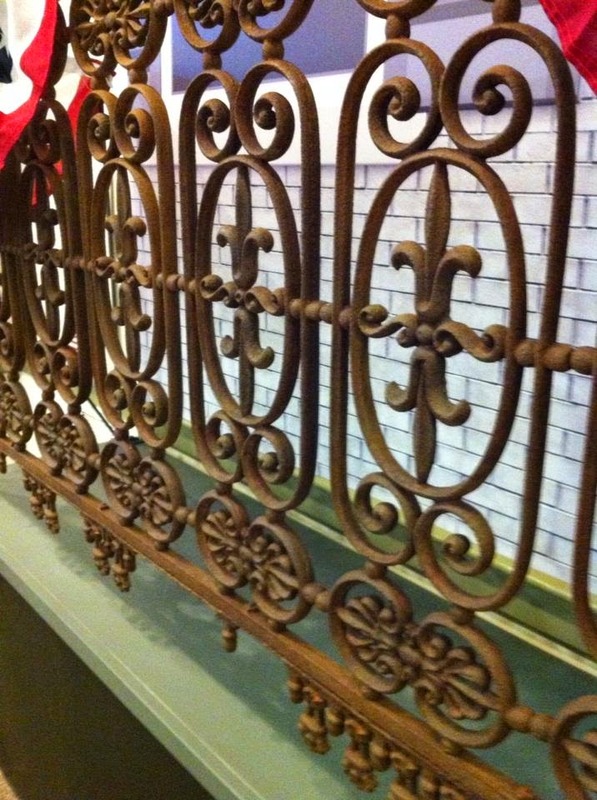 April 12: Spring Antique and Collectable Show—Another chance to see the new building and a wide array of vendors. Food will be available for purchase. Admission charged. 10 am-4:30 pm. UPDATE: April 17: PA Parks and Forests Foundation Photo Showcase—winning photos from the PPFF photo contest will be on display at the museum (during regular hours) through May 2. April 1: Friends Richard Koontz Memorial Lecture Series—"Remembering World War II, A Pilot's Journey" features Army Air Forces pilot John Homan discussing his experiences. (Centre Daily Times featured a great article about this talk and the need to share these stories.) Donations accepted. 7:30 pm. April 18: Lecture—Retired Air Force SGT Major Bob Baker will present "Air War: A First Hand Account of Combat and Capture," recounting his WWII experiences as a B17 flight engineer, gunner, and German POW. Included in regular admission. 1:30 pm. April 25: Kids Day I: Dress Up and Discover! !—kids of all ages can try on field gear and head gear from the museum education collection. Photo backdrops will be set up in the museum theater and there will be learning stations throughout the galleries. Included in regular admission. 10 am-3 pm. April 21-22 and 28-29: Archives without Tears—these popular two-day workshops provide practical advice, sample forms, and policies and discuss archival best practices so that staff can collect, preserve, and assist researchers with the archival treasures in their care. Open to anyone who works with archival materials. 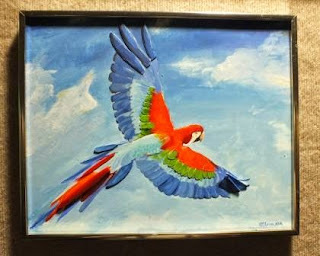 April 21-22 is at Lehigh Valley Heritage Museum, April 28-29 is at York County Heritage Trust. Cost is $25; partial registrations available for $15. Contact Josh Stahlman for a brochure, jostahlman@pa.gov or 717/772-3257 (or you can visit the Hidden Collections Initiative Facebook page to see the brochure - thanks HCIPSAR for sharing). April 9 & 11: Volunteer Training—training is open to current, active volunteers only, but it's not too late to enlist. Contact programs@rrmuseumpa.org for more information. April 25: Exhibit opens—“Riveted Jacket of Many Colors: A Photo History of GG1 No. 4800” explores the history of "Old Rivets," an iconic electric locomotive built by GE/Baldwin in 1934. Included in museum admission during regular hours, through December 31. April 6: “One Hundred Years Ago in Somerset County”—Somerset Historical Center interns will present a program based on their research. The program will be followed by the Historical & Genealogical Society of Somerset County’s Annual Meeting. Admission is free. 6 pm. April 10-12: Annual School of Coopering—learn traditional skills using traditional tools (hand power only) at this popular workshop. Contact the site at 814/445-6077 or c-mware@pa.gov for details. April 9: Storytime in Curiosity Connection—author Lindsay Barrett George will read her book Maggie's Ball. The program is geared for children ages 3-5. Included in regular admission. 10 am. April 17: 3rd in the Burg—educators Ann Devine and Jack Farster from the PA Dept. of Environmental Protection will present "Clean Watersheds, Clean Water" in the museum's Nature Lab. Included in regular admission. 10 am-noon. 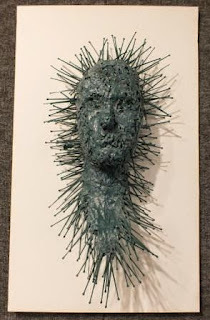 April 26: Exhibits closing—Last Last day to see "National History Day in PA 2014 Winners Exhibit," “South Central Pennsylvania Scholastic Arts Exhibit,” and "UnCommon Modern: A Pennsylvania Glossary of Midcentury Architecture." Included in regular admission. April 26: Architecture tour—the tour will cover public and behind-the-scenes areas of the State Museum and Archives Complex and focus on Midcentury Modern Architecture. Free with museum admission. Space is limited; contact Beth Hager at bhager@pa.gov. April 19: Big Band Concert—the Brian Pastor Big Band, a 17-piece ensemble, will perform in the Visitor Center auditorium. Tickets are $25 and can be purchased at the Visitor Center or by searching "Washington Crossing Historic Park" on Etix. 2 pm. April 26: Lecture—Dr. Nancy Loane will present "Wives, Widows, and Warriors: Women in the American Revolution" in the Visitor Center auditorium. Program is free. 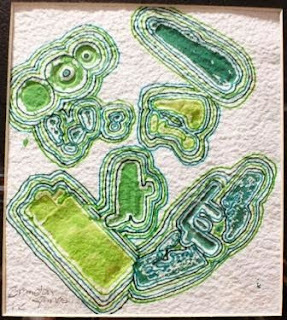 2 pm.